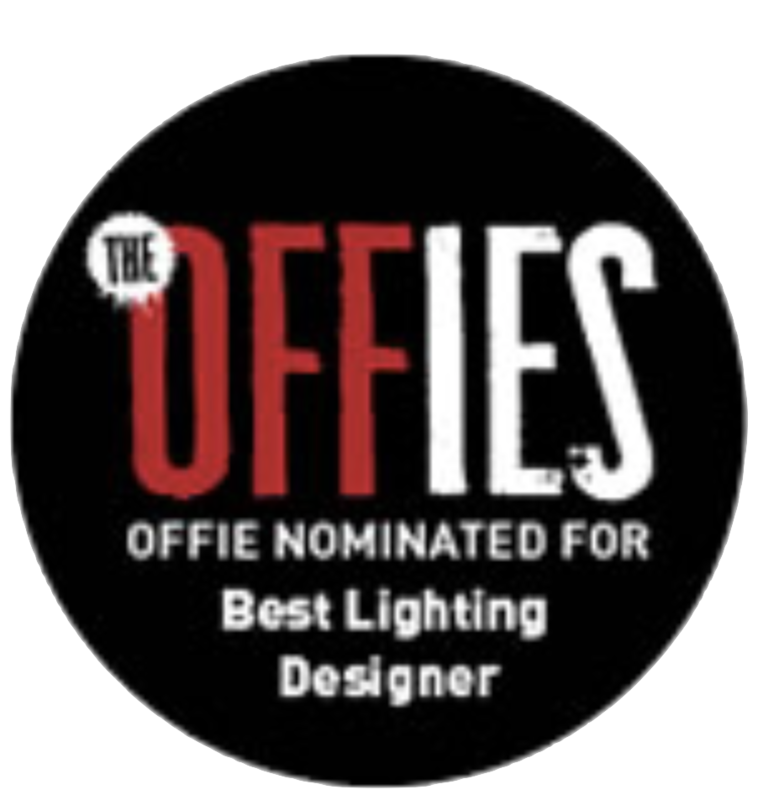 "The set is simple but for the lights which makes the stage look like a dingy night club - a fitting metaphor for the garage inspired script." 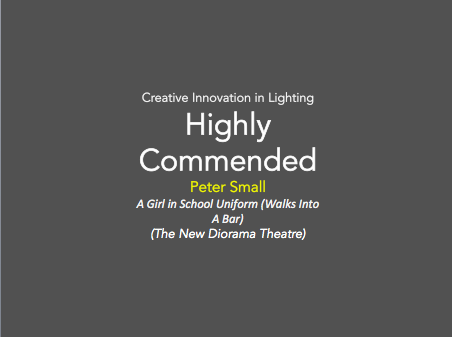 "With cool, stripped-back lighting by Peter Small"
"Peter Small’s lighting design pulsing with the beat of the spoken word"
"A special mention must go to lighting designer Peter Small who skilfully lights the actors for a sequence of touching monologues towards to end. Blink and you’ll miss it." 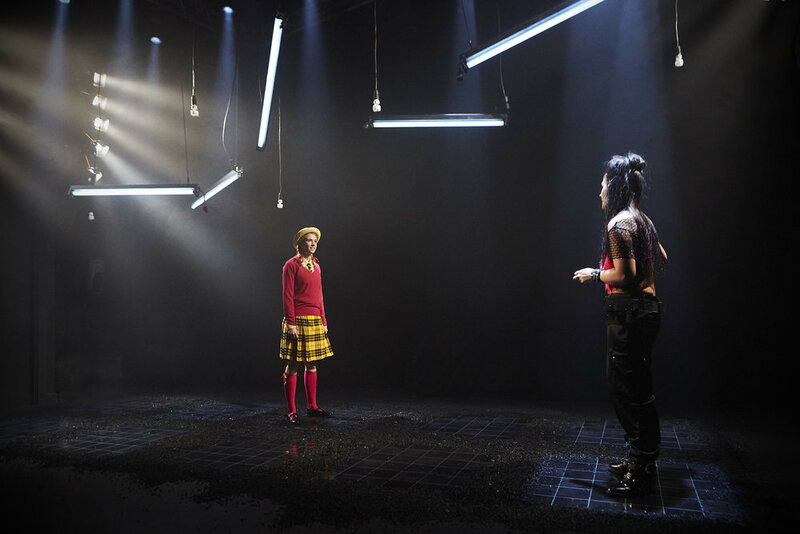 "A series of dangling light bulbs on rails above a bare set, laid out like a football pitch, and the cast slide these lights around to show changes in location, or focus, or to punctuate their anger. At one unforgettable point, during a sequence in which one story goes forwards while another goes backwards, the characters say “Blink” as the lights change. This has an incantatory, almost hallucinatory, effect. And it’s brilliant. 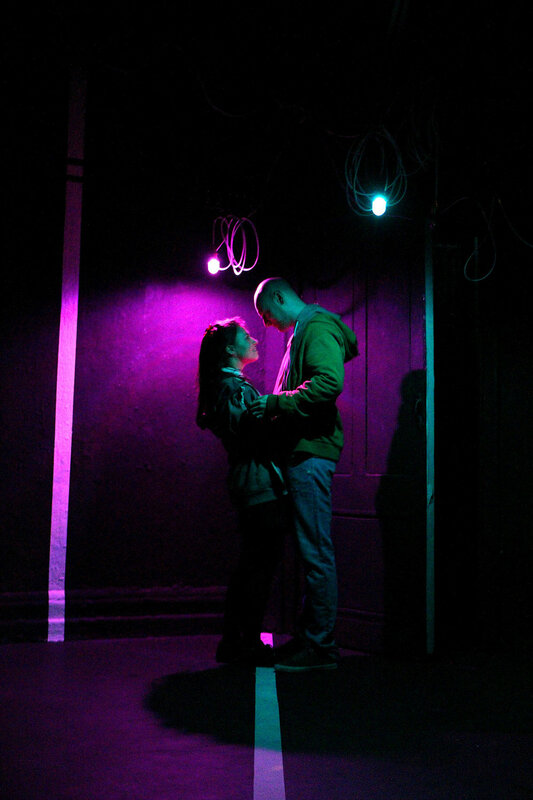 Thank you, Peter Small"
"Josh Roche's direction also nicely takes advantage of the performance space and smartly forgoes scenery in favour of Peter Small's excellent lighting - which consisting of lightbulbs hanging from overhead tracks that can be propelled across the stage." "Peter Small’s lighting work which does much to guide us about the internal lives on display here"
"Again, the ubiquitous lightbulbs take a hand as they flicker at the mention of ‘blink’ and ‘there’s a letter for you’. They represent punctuation in the script as the audience can barely divert their gaze. It’s a brilliant, almost Hitchcockian masterstroke as the story reaches its conclusion"
"Peter Small’s carefully judged lighting design heightens the tension"
"Sophie Thomas and Peter Small are jointly responsible for an ingenious design in which light-bulbs whizz through the air on overhead cables"
"Beautiful staging, the relatively simple set is complimented through the dynamic use of lighting. Singular light bulbs hang from bare wires suspended on tracks. This allows the lights to be slid, both gently and aggressively, across the stage, creating mini-worlds for the characters to inhabit, the bulbs change colour with the moods, and the overall effect is magical." "Peter Small’s lighting work is sharply effective too, transporting us through the years in a heartbeat." "The distortion of time is skilfully supported by the lighting design of Peter Small. The audience is guided through several light changes suggesting the fragmentation of time’s linearity. The playfulness with the flow of time refers to the process of memory: the older moments of their shared story is barely lit, but a longer sequence in comparison to the shorter, but brighter sequences of the later relationship. Significant are the shadows, which, grow bigger and thus cover the stage of the couple’s relationship. The absent presence of what have been and is not anymore, is visually captivating as the core of the story, moments’ fleetingness." "The lighting and music excel in setting the mood"
"Beautifully crafted by all the creative team"
"Performed in the round with no set apart from a piano stool, the entire weight of the play depends on the actors backed up with some very effective lighting (Peter Small)"
"The leaps in time in Old Fools are perfectly smooth and integrated, assisted by a superb lighting direction which helps in differentiating the space/time transitions." "The different moods of the piece were really well reflected in the lighting and in such a small and intimate space to get that right, is a real craft"
"Subtle, swift and seamless well coordinated lighting"
"Some gorgeously stylish transitions involving flashing lights and sudden blackouts"
"At first, the performance has a film noir-ish vibe, amped up by moody lighting"
"Peter Small’s atmospheric lighting design, all flickering fluorescent tubes and sharply defined shafts of near-light, gives way to absolute, complete darkness for much of the play’s 80-minute running time"
"Peter Small’s lighting, which often plunges the audience into a disorienting darkness so deep and shroud-like it feels as if the show has slithered off the stage and into the auditorium, where it proceeds to worm its way inside your head"
"A large proportion of Ali Pidsley’s production – made with playwright and Barrel Organ collaboratorLulu Raczka – takes place in total blackness, the lighting – or lack of it – designed by Peter Small. This sensory deprivation allows the storytelling to engulf the audience."